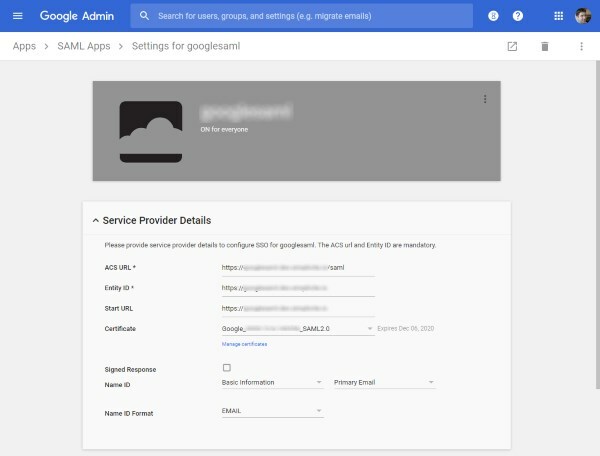 The example bellow is given for Google SAML Identity Provider (IdP) provider but this can be transposed to other providers. Note: This document only applies to version 4.0 and above. If you configure several SAML apps you must choose a unique entity ID for each of them. Then you can implement GrantHooks's parseAuth method to handle the returned Google account identifier if required. The example bellow checks and removes the domain part of the account name in parseAuth and creates/updates the corresponding application user on the fly in pre/postLoadGrant.